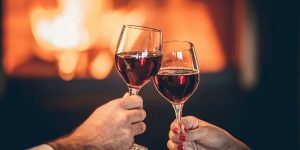 To get you through this extreme mid-winter weather, we’ve put together a selection of fuller-bodied red wines—the kind of wines that are perfect for fireside conversation and comforting, slow-cooked meals, like a nice pot of Cape Malay Curry. This really is a best-seller here at St. Marcus. It exudes a rich coffee aroma, while the fruity palate contains just a hint of cinnamon and chocolate. This wine is perfect for the novice and connoisseur alike. Being a versatile wine, the Diemersfontein Coffee Pinotage can be paired with anything from spicy food to game meats, as well as also chocolate desserts. This full-bodied red is deliciously spicy and full of smoky red-fruit flavours. Boschendal is one of South Africa’s oldest wineries, which draws on its French viticultural heritage in the creation of its wines, such as this superb Cabernet Sauvignon / Shiraz blend. Enjoy with a classic beef stew. Although on the pricey side, this is the splurge item. and it proves to be worthy of the title, as it’s true to the pinot fruit flavours with hints of musks and cherry. The translucent, purple-ruby appearance also makes for an attractive wine. This is a very versatile wine that can be served with white and red meats, parma ham, grilled line fish, tuna, wild mushrooms and traditional cheese. This list would not be complete without the chocolate block. Known for its powerful profile on the palate, what really shines is the hint of cocoa. One the nose, the wine has aromas of blackcurrant and sweet spices. Ideally served with roast beef. Yes, yes we know that this vino may not be the most elite, but in terms of nostalgia, this mix of Cabernet Sauvignon and Pinot Noir will take you down memory lane. Good Old Tassies with a couple of friends by the fire is sure to be an epic evening in. So, what do you think? Are you an avid drinker of a glass of red already, or will you be trying it today? Get social and let us know on our social media!